This paper presents data from official Cuban external accounts, from the reports of the Cuban Central Bank — Banco Nacional de Cuba (BNC) until 1996, then changed to Banco Central de Cuba (BCC) — and the UN Economic Commission for Latin America and the Caribbean (ECLAC). The BCC and ECLAC figures are broadly consistent because ECLAC uses official Cuban sources, but ECLAC has fuller back series of data and the BCC reports have the more recent data. The aim of this paper is to outline the information the official external accounts give to explain the decline and recovery of external trade and payments, and to indicate where the main gaps and uncertainties lie. These comments are as brief as possible, and are intended to serve as a basis for further discussion. 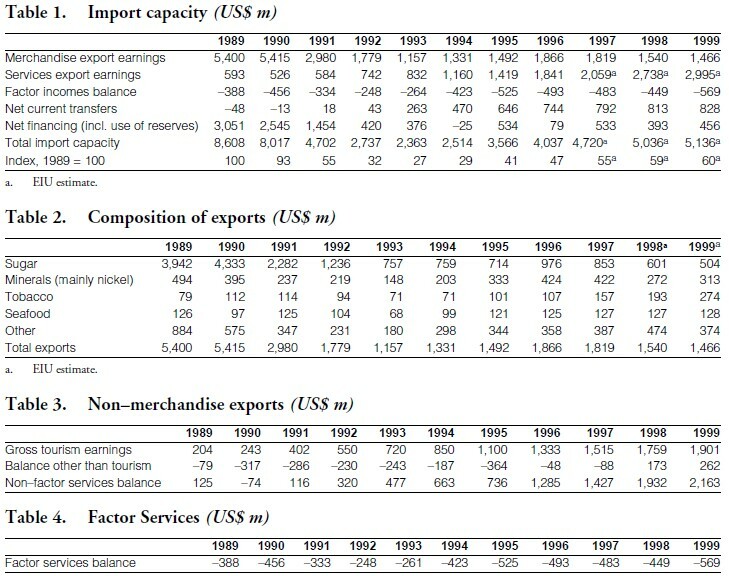 Table 1 gives an overall picture of the acute external shock, with a 73% fall in import capacity between 1989 and 1993. This decline arises from both a sharp fall in export earnings and the withdrawal of Soviet finance. Recovery of import capacity between 1993 and 1999 still leaves it at only 60% of its 1989 level. The data on the components of the current account are examined in the first section and the components of the capital account are discussed in the second section. The last section sets out brief conclusions. The collapse of sugar earnings — due to the loss of the Soviet sugar subsidy — is the main cause of the fall in merchandise export earnings (see Table 2). Total sugar export earnings have not recovered at all since 1993, and indeed reached a new low in 1999 (despite an increase in production in that year) because of unfavourable prices. Non-sugar exports have increased, but growth is concentrated among nickel, tobacco and seafood: there is little further diversification yet, as shown by the modest growth of the “other” category. The figures for “other” exports in 1998-99 capture inaccuracies in the Economic Intelligence Unit (EIU) estimates, which probably explains the erratic behaviour in those years. Our estimates for sugar in 1999 and nickel in 1998-99 are based on information available on export volumes multiplied by the average world market prices; the actual price earned will differ from this price although the movement will be in the same direction. Our estimate for sugar in 1998 is based on press reports that may be inaccurate. “Other” exports include biotechnology goods, for which there is little information. However, indications are that earnings have been disappointing so far. Growth of non-merchandise exports (Table 3, otherwise known as “non-factor services”) has been much stronger, and the main contributor has been tourism. There is insufficient information to determine tourism’s net contribution (foreign exchange earnings minus costs) to the Cuban economy. Official statements have put the net contribution at somewhere between 30% and 50% of earnings. We do not know, however, how these ratios are calculated. The EIU is seeking clarification from the ministry of tourism, but we do not yet have a clear answer. The balance on “other” non-factor services was negative until 1996 and has started to show strong growth since 1997. Telecommunications, professional services, transport (air and shipping) and music will be included here. There is no information on the contribution of the different services. It is worth noting that in 1998-99 the increase in this category has almost matched the increase in tourism earnings. This could mark a “take-off” in some sectors. The net factor services balance (Table 4) is, as would be expected, negative throughout the period. We have no published information on the composition of the flows in this category, but can observe that the degree of fluctuation is modest compared with other categories in the current account. We do not know the magnitude of factor inflows. There is a nickel factory in Canada and there have been reports of some small investments in other countries, but these flows would surely be dwarfed by interest payments and profit repatriation flowing out of the country. If the profits of Cuban state corporations registered abroad, which include some of the largest tourism corporations, were included in this category they would have a significant weight. In the early 1990s, net factor income outflows diminished. We would expect this to happen as trade credits dried up and so interest payments on this credit also diminished. Since then, we would expect interest payments to have increased as a result of new borrowing and growing repatriated profits on foreign direct investment (FDI). However, the overall balance on factor incomes has remained relatively flat. There are several possible explanations. One is that the increase in foreign borrowing in 1994-95 was sharply curtailed from 1995, in response to the sudden growth in the burden of interest payments. In 1996 there was a large increase in “bilateral intergovernmental loans” which may have enabled the Cuban borrowers to switch from expensive private credits to cheaper finance. Or it could be that the growth of FDI inflows from Cuban corporations registered abroad has been sufficient to offset an increase in interest payments over the past few years. We need a more detailed breakdown here. The final element of the current account is net transfers (Table 5). Some accounts have misleadingly suggested that net current transfers mainly represent remittances from relatives in the United States. The total also includes earnings from the informal tourist sector, which has boomed over the 1990s. If asked, Cubans offering services for tourists would of course declare that the money was remittances, because there are no laws against receiving remittances. There is a very strong correlation between the figure given for net transfers and the total for sales in the dollar shops. This is not by chance: the figures are calculated as the turnover of dollar shops minus dollar earnings accounted for by official payment of dollars (mainly through incentives schemes). Over the past two years informal activity related to the tourist sector has faced tougher competition from the formal sector as well as a tightening of controls. This explains the falling ratio of net current transfers/ gross tourism earnings, shown in Table 5. In order to find the actual level of remittances from relatives in the United States, a comprehensive survey the senders of remittances would be needed, because restrictions on transfers — and their high cost — ensure that most of the money sent does not go through formal channels. However, even if we had an accurate measure of remittances sent from the United States, that would not tell the whole story, as contact between Cubans and countries other than the United States has been greatly increased by tourism, increasing remittances flows from those countries. • All the figures are shown as net flows, and even those are probably incomplete. • There is a very large “others” category. This includes net inflows of short-term capital but also includes errors and omissions. • Official figures for changes in hard currency debt do not tie in with the capital account flows at all. So what, if anything, can be deduced from the capital account figures? • The “total net capital flows” is the most certain figure there is. There is a rising trend, but the flows are very lumpy. The rising trend suggests that Cuba is gradually increasing its access to the international capital market, whether FDI or loan capital, and the lumpiness is an indication of how small the level of flows is, by historical or comparative standards, meaning that an important single transaction can skew the total. • The “net direct investment” figure does not seem to truly reflect flows of foreign direct investment. Responses from the Central bank suggest that much foreign investment in tourism is not entered here. The problem appears to be that most of the data is transmitted to the Central Bank by ministries, but since the tourism sector was reorganised into a set of relatively autonomous enterprises in the first half of the 1990s, reporting to the ministry of tourism has been disrupted. If this is the case, the FDI figure shown here is a poor indicator of the actual level of FDI. The large FDI figure in 1994 could have been mainly accounted for by a single transaction (possibly in telecommunications), with much of the finance raised having been deposited overseas, giving a large negative flow in the “other” category. • The level of reserves is a closely guarded official secret. Annual changes only are given, since 1994. Reserves are reported to have grown since 1994, but extremely slowly. Although international reserves are likely to be low, the unhurried pace at which they are being restored suggests that they are not critically low — or that there are other, offshore, reserves. In this brief overview of some very sparse data we can make some general observations about the changing structure of the external sector. The overall story described by the figures in the current account seems plausible. There are important gaps in the information, though, particularly on details of tourism earnings and expenditure and current transfers. On the capital account we can tell very little from the official data. The information provided in the Central bank reports provides in insufficient breakdown of flows and very few footnotes, so that even if we accept that there is a genuine attempt to move the accounts into line with international definitions we cannot gain much insight from the data. This is probably intentional, reflecting Cuban paranoia about economic intelligence, but contributes to the high premium paid by Cuban borrowers for foreign credits.